...then I wish those guys would get to work! Update at 8:30am... 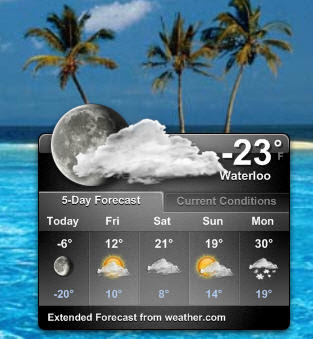 It now says -24, with an expected high of -8! It is currently 29F in TN...I think you may have an arguement for Global Cooling...it is suppose to be 4 tonight....I thought we lived in the south?!! We just cracked our expected high of the day. It's -7 right now! A heatwave is coming tomorrow and the next day... 11 tomorrow, 23 Saturday! Break out the swim suits! Yeah, global cooling. Well, at least U.S. cooling. :) Looks like a good portion of the country is running well below "normal." Bino, thanks for the link! Yeah, I was out there snow-blowing the other day, long before it got down to -24, but yet when it was below zero. When I came inside I could see that my legs were beet red, after only 15 minutes out there! So really it's not just uncomfortable; it really can be dangerous! We had 80 degrees in Texas last week. It's a little cooler now with highs in the 60's. Winter is a great time to live in Texas. Summer not so much. It snowed not long ago in Las Vegas. I guess hell did freeze over?